1 - If I had money I would actually buy this album when it drops next week. I love me some The Head and the Heart. 2 - For those of you who watched and enjoyed The Lizzie Bennet Diaries you'll be happy to know the same team has done a series called Emma Approved. I'll be saving them up so I can plow through them all at once. 3 - Since it's October I was craving fallish things. The weather hasn't been cooperating so I had to take matters into my own hands and make something pumpkin-y. Pinterest came to my aid and I made Joyful Momma's Kitchen's pumpkin scones with a maple glaze. They were delicious! Make some right now. 4 - So.... The Walking Dead... I just buzzed my way through the whole of season 3 so that I can... I don't know, wait another year until season 4 is on Netflix. I know what you're thinking. "Hey Bonnie, do you really think you should be watching that show any more? Remember how you couldn't concentrate enough to even pump gas because you became so preoccupied by the zombie apocalypse? You could barely even sleep at night you were so scared and worried about what you would do and how you would save your children in a world full of walkers. What are you doing?" Yes, it is true that I do keep a pair of knitting needles in my car so I can stab a zombie in the eye should the world ever come to that. However! The show The Walking Dead has become much more about the survivors than the zombies and I'm interested in those characters. Especially Herschel and Darryl - I love those two men. 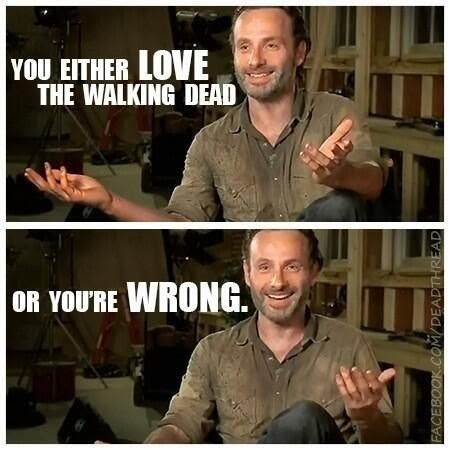 Plus, Woodbury and the prison are not locations similar to my life so it seems more like pretend. (What?! It is pretend you say?! Well I say I will be prepared because I am taking all kinds of mental notes, friends!) When Rick, Glenn, Carol and the rest were on the run, holed up in homes and the farm, driving through the country or city and passing all kinds of walkers, well, that was just a little too close to my imagined reality and it freaked me out a bit. 5 - It's funny the things you celebrate when you're a parent. For example: JP had become a little backed up. A week and a half ago he had a poopy diaper and then nothing but a couple of sharts for the next week. He was super fussy and I was super confused because he's only getting breastmilk - what is there to constipate him? Anyways, the doctor said to give him 1-2 teaspoons of prune juice a day until he had a BM. Three teaspoons later and JP pooped! It was at dinner and we all cheered. The next morning he pooped again and I called my husband to tell him. The next day he pooped again and my mom and I applauded. And now I think he has allergies like his brothers so boo to constricted diets but yay to pooping, happy babies! 6 - Speaking of pooping, happy babies. : A HUGE congrats to my friend Kathryn! She's pregnant with her 6th baby and I'm so happy for her. If you haven't yet, head on over and read all about her exciting news. And then, even though she hasn't said it, please say a prayer for her, her husband Scott, and their new baby. Their baby #5 was a NICU baby and I know that once you experience the NICU you are forever afraid of it. Kathryn, I'm praying for peace in your and Scott's hearts and for a healthy baby. Also, I'm hoping for a girl. 7 - Yesterday the kids and I were driving to the grocery store in a neighboring town called Washington. L, who is learning Spanish at school, asked me how one says "Washington" in espanol. I explained that you would just say "Washington" because it doesn't translate. Ben then said, "Washington. HEY!!! I just spoke SPANISH!!" He was so proud and excited -it was awesome. Many thanks to Jen for hosting! You're the best, Mrs. Fulwiler! My cousin lives just outside of the little town where TWD is filmed and a young lady from our church is on the makeup crew. I've never watched it, though. I have issues with scary stories. My son and his friends, however, have developed a Zombie Apocalypse Survival plan that involves coming to live in our basement so that they can survive off fish out of our lake. It's insane! Pooping - oh the joys. It only took me 4 babies to recognize the poop-transition that occurs around 3 months as something normal (at least for my kiddos - also exclusively breastfed). I had 1 poor baby that didn't poop for 11 days. No, I'm not exaggerating. It was awful for me, but she didn't seem to notice. I never put it together with allergies, though. You might be on to something. Current baby is on about day 3 without a significant poop. But her toots, oooooooh girlie, what a smell. Haha. Loved the last one! I loved your poop story, and the fact that you used the word "shart." My zombie knowledge is all from I Am Legend and Shaun of the Dead, which are both awesome, now I want to see Walking Dead and Lizzie Bennett! Look up The Autobiography of Jane Eyre. I love it so much more than the Lizzie Bennet diaries which annoyed me from time to time. Zombies scare the crap out of me. When Ryan watches it, he has to go to his brothers house or I go to bed otherwise I get horrible nightmares. Plus i get so emotionally invested in characters so easily that if something bad happens to them, my whole life is wrecked. #5 Yes! I love The Walking Dead, and Herschel and Darryl are my favorite, and I keep knitting needles on me at all times, too! And I also have to wait until next year to watch season 4 on Netflix. And . . . my best friend's brother is the keyboard player in The Head and the Heart, it makes me so happy that you like them! The hubs and I started watching TWD last year and went through all 3 seasons. It also inspired us to finally put together our zombie apocalypse survival kit (we just told others it was for the next big earthquake.) But we'd be watching a show and comment, you know we really need a (fill-in-the-blank) in our supply kit so we could better take down a zombie. (And we'd only be half joking.) ;-) Also, is it weird that I can't help but wonder if Maggie has learned NFP because how is she not getting pregnant w/o birth control.